"The world is currently undergoing the largest wave of urban growth in human history. More than half of the global population is now concentrated in urban areas, and by 2060 two thirds of the expected population of 10 billion will live in cities. We are adding about 1.5 million people to cities every week for the foreseeable future. These new city dwellers will need housing and services, from schools, offices, and health facilities to airports and train stations. In order to achieve the target set by the Paris Agreement—to limit the rise in global average temperature to below the 2 degree C threshold—all new construction must be designed to high energy efficiency standards and use no CO2-emitting fossil fuel energy to operate; by 2050 the entire built environment must be carbon neutral. Why is the ZERO Code so important today? We now have a critical window of opportunity, as well as the necessary tools needed to address this massive amount of new construction before its operating emissions are locked-in for decades to come. 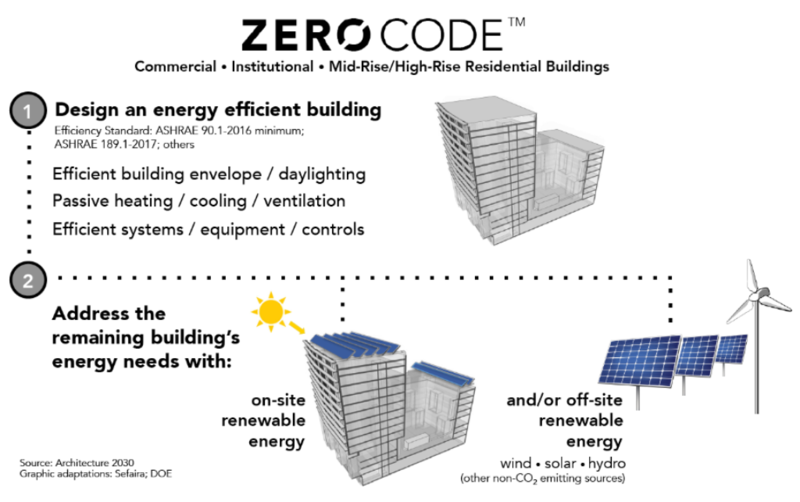 The ZERO Code, which can be adopted immediately, results in ZNC buildings. It accomplishes this by incorporating current and cost-effective energy efficiency standards with on-site and/or off-site renewable energy provisions. Only by eliminating CO2 emissions from new building operations will renewable energy additions, and existing building stock energy efficiency upgrades, begin to reduce building sector emissions overall. To meet Paris Agreement targets, action is needed today to implement the ZERO Code worldwide." Read more and subscribe to get updates from Architecture 2030 here.